Senator Chuck Grassley says President Obama gave him an impression yesterday of the kind of person Obama will nominate to serve on the U.S. Supreme Court. Grassley met privately with the president for an hour Wednesday, over lunch, and the topic of the next Supreme Court justice was discussed. "This is an implication in my words and not anybody else’s words, that it’s not going to be somebody that’s a bomb-thrower," Grassley told reporters from Radio Iowa and The Des Moines Register after his meeting in the White House. Grassley, a Republican, is a member of the Senate Judiciary Committee, the panel will hold hearings to publicly interview whomever Obama nominates. So did Grassley get the impression Obama already knows who he intends to nominate for the nation’s highest court? "Not at all," Grassley told Radio Iowa and The Des Moines Register. 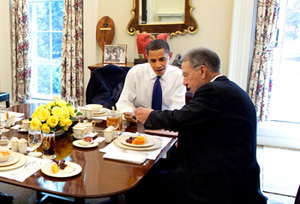 Grassley met Wednesday with President Obama, Vice President Biden and the Democrat who chairs the Senate Finance Committee primarily to discuss health care reform. Grassley is holding out hope the president will be able to wield his influence with Democrats and force a bipartisan compromise that includes concessions Republicans seek. "If you’re doing something that significant, it ought to be very bipartisan," Grassley said. Read and hear more about yesterday’s meeting here.